Taller de Bomba Balancé, an Afro-Puerto Rican traditional drumming and dance group, got Sur La Bay started Feb. 2. 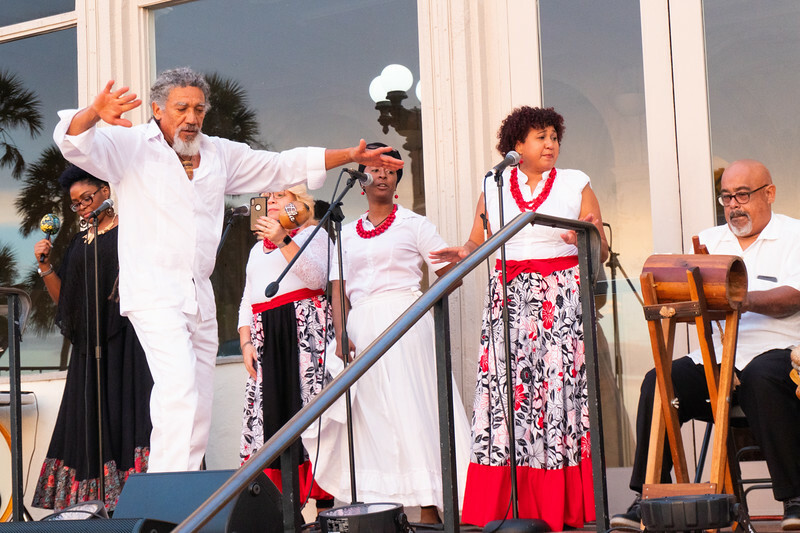 Sur La Bay, a concert featuring the music of the African diaspora and its influences across the world, kicked off Black History Month celebrations at New College of Florida Feb. 2 at College Hall. Performers from central and south Florida represented the spectrum of musical genres within black music, from hip-hop to Afro-Cuban jazz. Taller de Bomba Balancé, an Afro-Puerto Rican traditional drumming and dance group, got the show started for members of the campus community and the public. A traditional dance and musical style, Bomba is rooted in Puerto Rico’s history of African slavery. Sur La Bay also brought artist Enso-Stranger, an ensemble of hip-hop fusion with a message of self-love and empowering others through music, as well as Miami rapper SDotBraddy. Closing the night was the Guisando Caliente Latin Jazz Quintet who showcased the sounds of Afro-Cuban influences. Click here for more information on upcoming Black History Month events, including performances and workshops.